Alzheimer's 'Epidemic' Now A Deadlier Threat To Elderly : Shots - Health News Deaths from the disease have increased by 68 percent between 2000 and 2010. One reason: We're living longer, and deaths from other causes, like heart disease and prostate cancer, are going down. 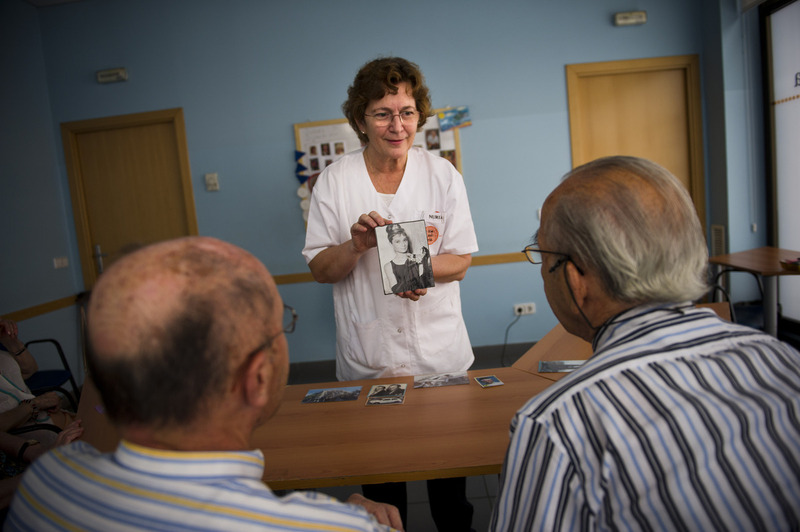 Social worker Nuria Casulleres shows a portrait of Audrey Hepburn to elderly men during a memory activity at the Cuidem La Memoria elderly home in Barcelona, Spain, last August. The home specializes in Alzheimer's patients. "It's an epidemic, it's on the rise, and currently [there is] no way to delay it, prevent it or cure it," says Maria Carrillo, a neuroscientist with the Alzheimer's Association. More than 5 million people in the U.S. have the disease, she says, and that number could reach nearly 14 million by 2050. One reason Alzheimer's deaths are going up is that deaths from other causes, like heart disease and prostate cancer, are going down, Carrillo says. "We're living longer," she says, "and unfortunately age is still the greatest risk factor for Alzheimer's disease." 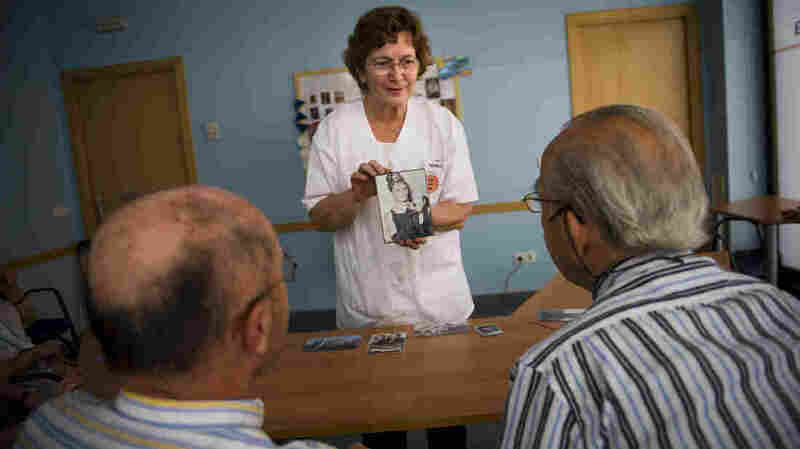 There are still no effective treatments for Alzheimer's, and people who have the disease face a greatly increased risk of dying within 10 years, according to an analysis by the Alzheimer's Association of data from the Centers for Disease Control and Prevention. "If a person is living with Alzheimer's disease in their 70s, it actually doubles their mortality risk," Carrillo says. It's still tricky to decide when to blame Alzheimer's for the death of a particular person, though, says Susan Mitchell, a professor of medicine at Harvard and a scientist at Hebrew Senior Life Institute for Aging Research. That's because Alzheimer's patients tend to have other health problems as well, she says. As a result, Mitchell says, many death certificates still list pneumonia or some other disease as the cause of death, even when the underlying problem is Alzheimer's. "So even the statistics that show dementia increasing as a cause of death are a gross underestimate," she says. Because Alzheimer's damages cells in the brain, it often kills in ways that are indirect, says Mitchell, an author of a 2009 study of more than 300 nursing home residents with advanced dementia. "In the early and middle stages, the changes to those nerve cells mostly affect memory and behavior problems," she says. "But as the disease progresses toward the end stage, the brain changes eventually affect basic bodily functions," including swallowing. This seemingly simple act requires the brain to orchestrate a complex sequence of muscular contractions, and that sequence often goes awry in people in the later stages of Alzheimer's, Mitchell says. "That can often lead to a lung infection if the food goes down the wrong way, and that is a common cause of pneumonia," she says. Alzheimer's and other dementias also can affect a person's balance and ability to walk, which can lead to falls and injury, Mitchell says. And she says damage to the brain itself can cause fatal seizures. But the most common causes of death in people with late-stage Alzheimer's are fevers and infections, Mitchell says. She says this is because the disease has gradually eroded the body's defenses. "The body is so debilitated, frail and weak at the end of dementia that some of the usual immunological and metabolic factors that can protect a healthy body from infections and fevers really become susceptible," Mitchell says. Yet many families of people with Alzheimer's don't realize that the disease goes after the body as well as the mind, Mitchell says. So it's important that health care professionals explain this aspect of the disease, she says. "By understanding dementia as a terminal illness, we can much better prepare and counsel families about what to expect at the end stage," Mitchell says. And research shows that when they fully understand what is happening, she says, they are less likely to request extreme measures to keep a family member alive.